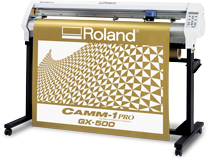 Roland ASD cutters produce crisp, eye-catching graphics with speed and precision. Applications include vehicle graphics, signs, decals, labels, stencils, pin-striping, clear protective coating, and logos. Speed. Power. Precision. The Roland GX Pro series lets you shift your graphics business into high gear. Powered by precision-controlled digital servomotors, these professional-grade vinyl cutters achieve maximum accuracy and cutting speeds up to 33 inches per second with up to 350 grams of downforce. Vehicle graphics, window tint, signage, labels, stencils and even pinstriping come out crisp and clean. These advanced cutters also include an optical registration system, making it fast and easy to contour cut full-color, pre-printed graphics. The ability to match an existing printer with the GX Pro gives you a powerful and cost-effective print/cut solution. This feature lets you blow the doors off the competition with popular jobs like heat-transfer graphics for t-shirts, full-color POP displays, and vehicle wraps. The all-new CAMM-1 GS-24 is compact, but don't let its size fool you--it really packs a punch. It all starts with a completely redesigned cutting carriage and blade holder, which ensure greater stability. The GS-24 also flexes its muscles with 350g of downforce, making the cutting of magnetic materials, card stock and other thick substrates child's play. It also cuts vinyls, pressure-sensitive twill, flock, rhinestone stencils, and more at a max speed of 20 ips. Print-and-cut jobs? No problem. The GS-24 is equipped with an optical registration system that easily and accurately aligns pre-printed materials. The GS-24 also boast Overlap Cutting (up to 10x), Perforated Cutting, and specially-designed software so you can create graphics that stand out from the crowd. Easy to use. Affordable. Versatile. Roland STIKA desktop design cutters allow users in small offices, schools and homes to produce a wide range of custom graphics. The STIKA makes it easy to create everything from POP displays and iron-on graphics for T-shirts to vehicle graphics. The STIKA also makes a cost-effective print/cut solution. Just print registration marks on your graphics with your desktop printer, load the printed graphics on the cutter, and set the position of the registration marks using the STIKA driver. Making professional-looking graphics with the STIKA is a snap!